When Uganda native Edith Wakida became interested in pursuing a graduate degree in research administration, colleague Harriet Nambooze recommended that she look into the Master of Research Administration offered by UCF. Nambooze was pursuing that degree herself, and since it was offered completely online, it enabled her to further her education from a world away. Lecturer and M.R.A. program director Jo Ann Smith, Ph.D., has found that students from different parts of the globe, such as Nambooze and Wakida, are increasingly becoming more attracted to her program. She explores this growing trend in an article published in the December issue of the National Council of University Research Administrators Magazine. The article, titled “Future Trends: The Growing Diversity of Research Administration Observed in a Master of Research Program,” was co-authored by Jennifer Shambrook, Ph.D., an adjunct instructor and director of research programs and services for the UCF Office of Research and Commercialization. 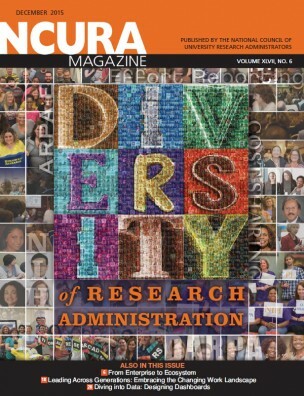 This particular issue of NCURA Magazine focuses on diversity, something Smith and Shambrook have seen expand in both the profession and the program. “Since the inception of our program in 2011, half of the graduate students that have enrolled are ethnically diverse (59%), originating from four different countries (Uganda, Pakistan, Rwanda and Nigeria), from eight different areas of specialization and 25 different states,” they wrote. Smith and Shambrook attribute this shift to the fact that the program follows the cohort model, which enables students to advance together through the program during a two-year period. This allows for more meaningful interactions among peers, which in turn, creates long-lasting relationships and a greater sense of community. “Sharing information, experiences, and their lives is possible because the extended amount of time working together allows for the necessary level of trust to be built for open and meaningful communication,” they wrote. These meaningful relationships proved fruitful for Wakida, who received advice and guidance from Nambooze throughout her first year at UCF. She also received tremendous support from her cohort when she became pregnant with twins and was bedridden for a few months before the delivery. Wakida graduated with her M.R.A. earlier this year, while Nambooze graduated in 2014. Both of them traveled to Orlando for their commencement ceremonies, and to visit their alma mater in person. Now, as full-time research administrators, they have found themselves back in higher education. Nambooze works at Makerere University’s College of Health Sciences in Kampala, Uganda, while Wakida works at the Mbarara University of Science and Technology in Mbarara, Uganda, which was recently awarded a $3 million grant from the National Institutes of Health because of her hard work. In their article, Smith and Shambrook said that they are proud to train the next generation of research administrators through the M.R.A. program, particularly as the previous generation of baby boomers exits the profession. As new studies show that a graduate degree is the norm for the profession, the co-authors portend that their diverse and familial program has become more valuable. Read the full article from NCURA Magazine.